Roll Call of the 23 Brunswick County men who sacrificed their lives during World War I. Roll Call of 150 Brunswick County WWI veterans, a continuation of the list of 724 that began at the April 6, 2018 recitation commemorating the start of the war. Special Guests will include descendants of Pvt Harvey T. Chadwick, one of the men from Brunswick County who made the ultimate sacrifice during WWI while breaking the famous Hindenburg Line on September 29, 1918. Priceless heirlooms from the Chadwick family will be available for viewing, including the American flag that draped his coffin when his remains were returned in December 1921, and the Certificate of Appreciation for his sacrifice. If you are a descendant of a Brunswick County WWI veteran and would like to be recognized or share WWI photographs or artifacts, please contact Friends of Fort Caswell Rifle Range. On Tuesday, July 3rd, at the Southport, NC River Front Park on Bay Street during the three day NC July 4th Festival in Southport, the Friends of Fort Caswell Rifle Range set up their Community Non-Profit Spotlight Booth. Russ Barlowe (Friends of Fort Caswell Rifle Range VP) sat in a patriotic setting with a red, white and blue banner displayed across the front of a table. 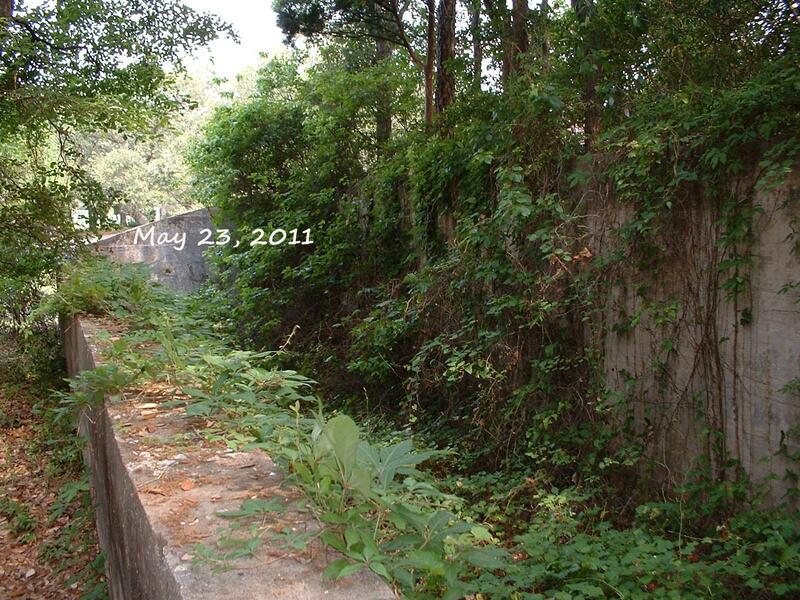 “Help save the rifle range” and “Honor a Brunswick County WWI Veteran” were clearly visible. Russ was dressed in patriotic clothing under a bright red umbrella with a table covered in stars and stripes to answer questions about the Friends of Fort Caswell Rifle Range, dedicated to preserving the WWI rifle range located on Caswell Beach. Dana Majernik and Cindy Harriet Etchison assisted during the 4 hours as people visited the booth asking questions about the rifle range and where it was located. Visitors honored Brunswick County World War I soldiers by making a donation, then receiving a certificate and NC WWI Service Card with the soldier’s military information. 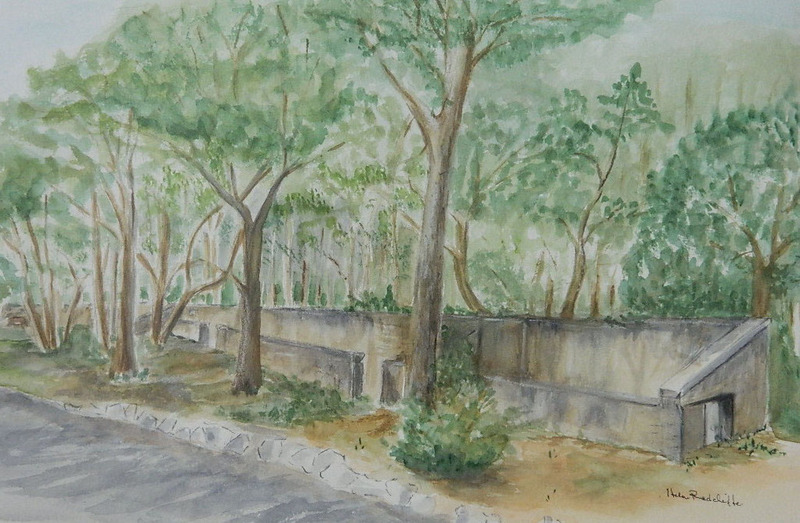 Note cards featuring Helen Radcliffe’s water color of the rifle range and 5 X 7 prints were available for purchase. Individuals made contributions and received a pamphlet telling the historical story of the 100 year old structure. Cards with information on how to contact the Friends group were given to visitors. Each year the Southport/Oak Island Chamber of Commerce offers one local non profit each day of the celebration to share their story. The Friends of Fort Caswell Rifle Range thank the chamber for the opportunity to be featured this year. See the updated Contributors page and the Honor a Brunswick County WWI Veteran: Donors for all of our wonderful supporters! in the Community Non-Profit Spotlight Booth from 11:00am – 5:00pm. Notecards for sale, 5 for $5.00, featuring Helen Radcliffe’s gorgeous watercolor of the rifle range. Certificates to Honor a Brunswick County WWI Veteran for a donation. Events calendar and map here. The fundraiser was a great success. Thanks to the special volunteers, donors, business donors, and supporters of the Fort Caswell Rifle Range, the fundraiser was full of fun and a success at raising money to continue with the stabilization. Supporters arrived, with many dressed for the Derby. Prizes were given later in the day for costumes and hats. Volunteers registered those attending, sold dinner tickets, and offered both Kentucky Derby tickets and tabletop race tickets during the day. During the festivities, an uninvited visitor (small alligator) watched from outside. Ten members of Brunswick Town Chapter, National Society Daughters of the American Revolution, and supporters of the Fort Caswell Rifle Range, attended. One corner was a reminder of those we honor as we save the historic structure in the neighborhood. The Doughboy Wall was overflowing with Brunswick County WWI Veteran names; next to it, the insignias of their divisions and special units could be viewed. This is a copy of a recruiting poster from 1919. The new baskets for silent auction were appreciated by all who attended. Helen Radcliffe, pictured here in her Derby attire, watches pensively as attendees look at goodies in the baskets she created. Helen’s hard work resulted in a big boost to the Friends of Fort Caswell Rifle Range. This table displayed many baskets; however, the entire room was overflowing with them! More items for sale, made by a distant supporter of the rifle range. The tabletop races were enjoyed by all. Dinner and cake was served before the official Kentucky Derby. The thermometer is going to need an update soon! We’ll be sharing our thanks to volunteers, donors, and local businesses in the coming days. Thank you! The 1918 Fort Caswell Rifle Range was recently designated a National WWI Centennial Memorial. Who has the authority to designate National WWI Centennial Memorials? Who serves on the WWI Centennial Commission? Three members appointed by the Speaker and minority leader of the US House of Representatives, three members appointed by the majority and minority leaders of the US Senate, three members appointed by the President, one member appointed by the executive director of the Veterans of Foreign Wars of the United States, one member appointed by the executive director of the American Legion, one member appointed by the president of the Liberty Memorial Association. 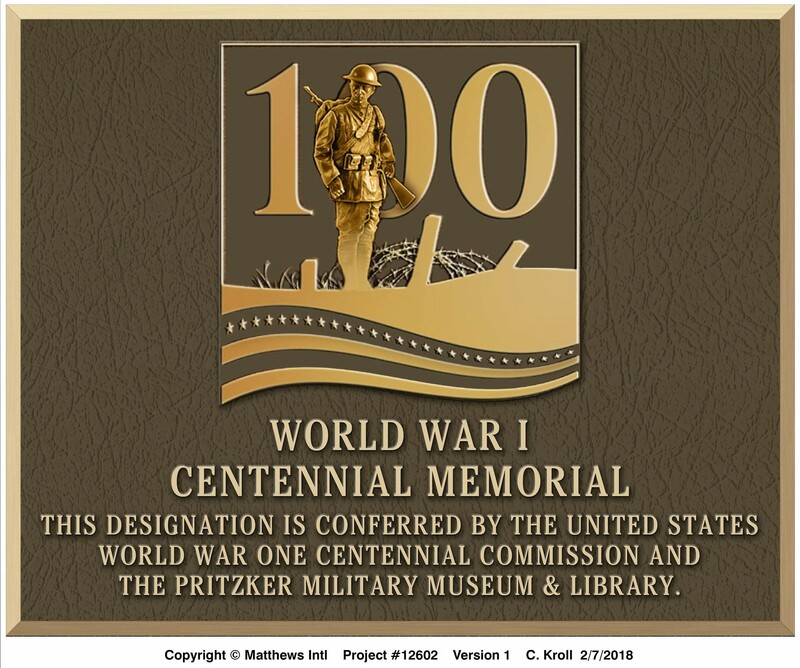 The 100 Cities / 100 Memorials program, which named the 1918 Fort Caswell Rifle Range a WWI Centennial Memorial, is sponsored by the US World War One Centennial Commission and the Pritzker Military Museum & Library with support from the American Legion and Veterans of Foreign Wars. The Daughters of the American Revolution is a WWI Centennial Commission partner. How did the rifle range earn the designation? A proposal to the WWI Centennial Commission was created using all of the information from the past seven years found on this website. This includes the Stabilization, History, Fundraising, News, WWI Wall of Honor pages, and the Honor a Brunswick County WWI Veteran program. How many memorials were designated in the United States? 100 memorials in the United States were designated Official WWI Centennial Memorials. The list may be found here. How many in North Carolina? There is only one other memorial designated as an official WWI Centennial Memorial in North Carolina. The North Carolina State University’s Belltower in Raleigh was also designated. The Memorial Tower was built to honor NC State’s alumni who were killed in WWI. Today, May 1, 2018, a full military ceremony will be held at the Belltower in Raleigh. It includes a 21-gun salute and a flyover of F-15s from the 4th Fighter Wing stationed at Goldsboro’s Seymour Johnson Air Force Base. 1000 blooming poppies, planted by a horticulture science class, will be in planters surrounding the belltower. “We want to wake up the area with North Carolina’s major event to celebrate the Centennial Commission,” says Hester, a 1953 NC State graduate and retired U.S. Air Force veteran. “We have the nation’s only belltower that is dedicated to students [and alumni] who sacrificed everything in World War I. The Friends of Fort Caswell Rifle Range will have members attending and plan to share pictures in tomorrow’s post. A new Doughboy Wall of Honor will be displayed along with the World War I Wall of Honor. The WWI Wall of Honor shows photos of WWI veterans that were sent to the Friends of Fort Caswell Rifle Range. This has been on display during the Derby and other special occasions for several years. Photos have continued to be received and added to the Wall – – both the physical one and the page online. See the online version for the very special photos shared by family members. On the other side of the Wall is the new Doughboy Wall (seen here in progress). This Wall honors the Brunswick County WWI Veterans. Framed and typed cards show many of the veterans that readers have become familiar with by reading the WWI Profiles on the blog. These profiles have been posted on the website each Monday. Check tomorrow for the new profile which for the first time, includes a photo submitted by a Brunswick County resident! To view the WWI Profiles already published, click on the veteran’s name on the WWI Brunswick County Veteran list, which is also accessible by the blue button on the top right of the webpage. Themed baskets are new at this year’s Derby Day Fundraiser. Local artist Helen Radcliffe took the lead. Many items were donated by local businesses. More about their donations coming soon. Note: Helen Radcliffe is offering a silent auction item again this year: to the winning bidder, an original painting of their home. The Tabletop Races are a fun activity during the Derby Day Fundraiser. There are six races with six horses each. Each horse has an owner, which costs $10. Some horses are still available. Click here to view the list. For several years, horses were given names using words associated with the area, such as Gator Bait and Bunker Beauty. Last year, the focus was on WWI. The horse names were Over There and Meuse-Argonne, among others. With the launch of the Honor a Brunswick County WWI Veteran program on November 11, 2017, it seemed appropriate to create names that would recall the courage and strength of the county’s veterans. Each horse name is in honor of a veteran who was killed, died of disease, or wounded. The name is taken from division or unit mottoes, nicknames, or something similar. Names were created such as Everlasting Support, a motto created later for the 105th Engineers, Undaunted, the motto for the 119th Infantry, Old Hickory, the nickname for the 30th Division (the division served by more NC veterans than any other), and Hindenburg Line, the assault that made the 30th Division famous and led to the end of the war. Click here to view the Brunswick County WWI Army/Marine veteran rosters. Fort Caswell nurses are also honored with their own race, with horses named after their residence at enlistment. For example, Chief Nurse Nellie E. Davis served at Fort Caswell through both WWI and WWII. She was from Denver, Colorado; a horse was named Denver in her honor. Click here to see all of the horse names, along with a link that lists those veterans being honored.